KIEV, Ukraine -- Mikheil Saakashvili, a former president of Georgia who was brought into the Ukraine government to set an example of transparency and clean government, resigned on Monday and accused Ukraine’s president of supporting corruption. Mikheil Saakashvili, the former president of Georgia, in January. He resigned on Monday as governor of the Black Sea region of Odessa, citing the central government’s obstruction of his efforts to root out corruption. Mr. Saakashvili, who was appointed governor of the Black Sea region of Odessa by President Petro O. Poroshenko in May 2015, said he was leaving because of the central government’s unrelenting obstruction of his efforts to root out graft. “The president personally supports two clans,” Mr. Saakashvili told a group of journalists. In a terse statement, Mr. Poroshenko’s office said it would accept Mr. Saakashvili’s resignation once it had been submitted by the cabinet. In Odessa, Mr. Saakashvili and a team of young reformists tried to tackle the acceptance of bribes in the corruption-plagued customs service and to make government services more responsive and transparent. Yet, government officials in Kiev thwarted these efforts, Mr. Saakashvili said, because they interfered with the various enrichment schemes that allowed many of them to amass healthy fortunes. Mr. Saakashvili said his plan to open a new customs service center in Odessa was undone when the money allocated for its refurbishment was stolen. He noted that some top-level government figures listed millions of dollars in savings in cash and other assets in financial disclosures that were mandated by the International Monetary Fund. One minister declared bottles of wine worth thousands of dollars each. 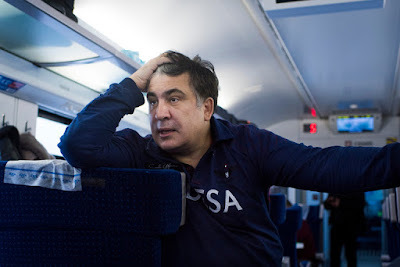 A bitter opponent of Russia and its president, Vladimir V. Putin, Mr. Saakashvili was one of several foreign politicians and specialists who were brought to Ukraine after the 2014 pro-Western revolution to start a broad modernization of the country. But there was always deep skepticism about whether Ukraine was capable of such a transformation, and many of those figures have since become disillusioned and resigned. In February, the economy minister, Aivaras Abromavicius stepped down, saying that he did not want to act as a “smoke screen” for corruption. The American-born finance minister, Natalie A. Jaresko, left the Ukrainian government in April. Taming corruption was widely seen as crucial for proving the legitimacy of Ukraine’s pro-Western leadership, especially in contrast with Putin’s Russia. In October, Mr. Saakashvili’s political party in Georgia suffered a painful defeat in parliamentary elections, ending the prospect of his return to that country, where he faces multiple charges that he says are politically motivated. Standing in front of Odessa’s seaport, Mr. Saakashvili signaled that he would continue to be involved in Ukrainian politics.